A hot spiced Kenyan style savoury mix made of potato sticks, lentils and nuts. 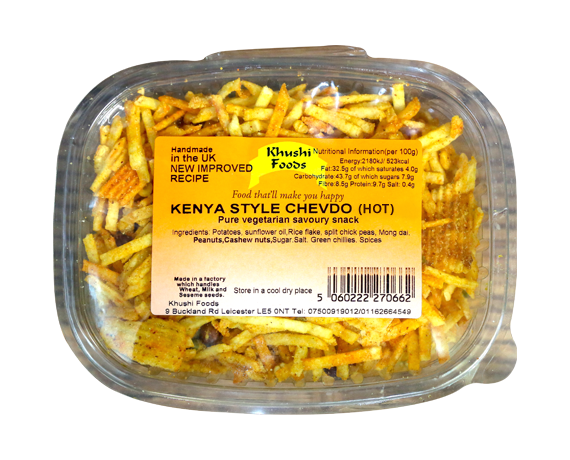 Our Hot Chevdo is made from the finest of ingredients including pure sunflower oil. Potatoes, sunflower oil, rice flakes, split chick peas, mong daal, peanuts, cashew nuts, sugar, chilli powder, green chillies, salt, spices. Suitable for vegetarians. Contains nuts. Made in a factory which handles dairy, wheat and sesame.